As per the Legend, Khara an asura of the Ramayana performed strict penance for Lord Siva. Impressed Lord appeared before him and blessed him with boon and Three Siva Lingas. Khara took hold of Lingas – One in each hand and the third one in his mouth and journey through the sky southward. On the way, he was overcome by the weight of the Lingas he carried and hence was constrained to descend and rest for a while. He Set the Linga in his Right hand on the Earth while taking rest. When he resumed, he tried to remove the Linga but all his efforts went vain. He left the Installed Linga at Vaikom and moved on. 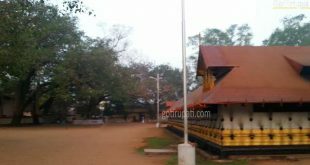 After travelling for a while, he installed the Linga in his Lefthand at Ettumanoor and the Third one at Kaduthuruthy, midway between the two places. It is believed that one must have Darshan on the same at these temples is highly auspicious. 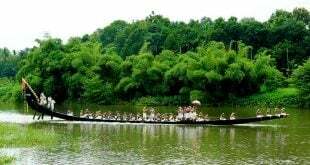 The main festival is celebrated in the month of Dec.
Men: White Pancha, Dhoti without Shirt. 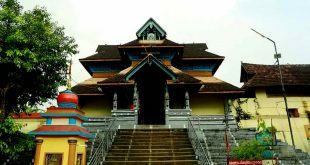 How to reach Kaduthuruthy Mahadeva temple? The nearest airport is at Kochi which is 63 Km away. The nearest railway station is at Kottayam which is 25 Km away. The direct bus is available from Kottayam to the temple.